How Much Is The Most Expensive Mac You Can Buy? A lot! You are here: Home / Tech / How Much Is The Most Expensive Mac You Can Buy? A lot! 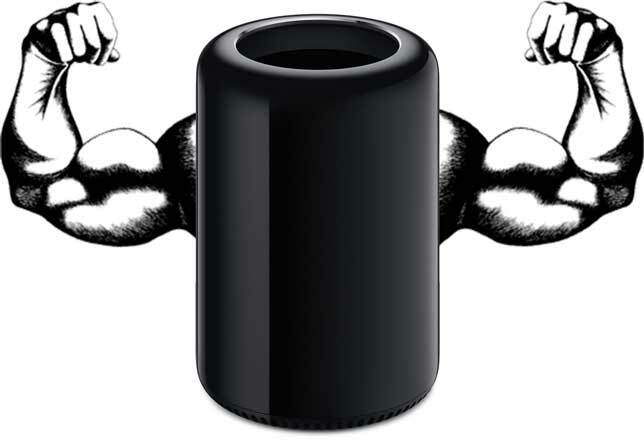 Just a little while ago, Apple has released its most powerful Mac yet – the Apple Mac Pro. It’s a beast. And a quite expensive one. If you visit the Apple Store website and choose a product you will be able to customise it and add a bit of extra RAM, processing power, accessories and other neat stuff to your brand new Mac. Haven’t you wondered how much the most expensive Mac set-up would cost you? Well, let’s find out. First, let’s take a look at the “standard” options for the Mac Pro. For just $3,999 you can buy a Mac Pro with a 6-Core and Dual GPU, 16GB RAM, dual AMD FirePro D500 with 3GB VRAM each and 256GB flash storage. FYI, these are specs of a model that we haven’t upgraded yet. This is just the high-end standard option. All of this you can get for just $9,848.00, which is $5,849 more than the standard high-end model. For this amount of money you could buy 20 iPad Air’s! A Mac with a setup like this is a beast. It is the most powerful Mac you can (officially) get to date. But still, a computer without a display, mouse and keyboard is just an extremely expensive piece of plastic stuffed with some more plastic, solder and other kinds of metals. So, let’s add a couple of accessories to our shopping basket. A great computer deserves a great monitor. Apple’s new 4K Display should do the job. Now we need a mouse (I prefer the Magic Trackpad) and a keyboard. $13.5k is not enough. How about some more extras? We need more screen space. How about the 27-inch Apple Thunderbolt Display? Need Final Cut Pro X, Logic Pro X and Aperture? No? Let’s buy them either way. And who doesn’t need a 1 year membership to Apple’s One to One service? They will even help you with setting-up your email and transfer your photos for you! Also, 1TB of flash storage in the Mac itself is obviously not enough. We need more. 32TB to be exact. Oh, and we will also definitely need a black 2 meter Thunderbolt Cable to connect the extra 32TB to the Mac Pro. Just to make sure we don’t lose our most important files (not that we don’t use Dropbox and Google Drive already), let’s buy a 3TB Time Capsule to keep all our files backed-up. One more thing: the same setup will cost quite a bit more in Europe – €20,489.97 or £17,157.00 in the UK (roughly $28,000), which is almost $8,000 more than what you would have to pay for the most expensive Mac in the US. If you need a new computer, have $20k lying around somewhere and you don’t mind spending everything… now you know how you could spend your money. To be honest, I can’t really imagine how powerful a machine like this would be and what it would be capable of doing. But I’m sure that professionals in the film industry will be able to push the monster Mac Pro to its limits (and then start complaining why it’s so slow in a little white). Would you ever consider buying a Mac setup like this? If yes, what would you do with so much power? Please share your ideas in the comments!